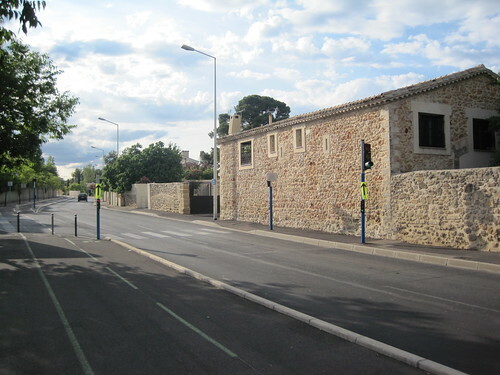 The Tour de France is in Montpellier tomorrow: every seven minutes a team departs la Place de la Comédie in the center, heading up the 1 km hill on our own Avenue du Professeur Louis-Ravas less than 4 minutes on, and then looping around to the NW, West, and SW, arriving at the Stade Yves-du-Manoir about 45 minutes later. 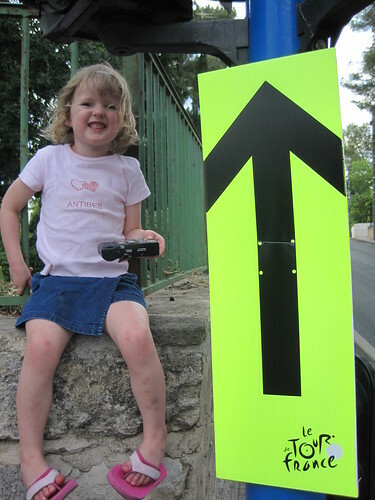 This evening, my oldest daughter and I went out to take some pictures in the rue before the race. This spot on top of a wall at the Maison pour tous Paul-Emile-Victor should be the best viewing location. I'm not sure how early I'll need to get out there with the patio chairs. An hour before the caravan? My kid is excited about the race: wants to be a bike racer when she grows up, race with her little sister (like the Schleck brothers), be fast like Mark Cavendish, and sleep in castles every night. 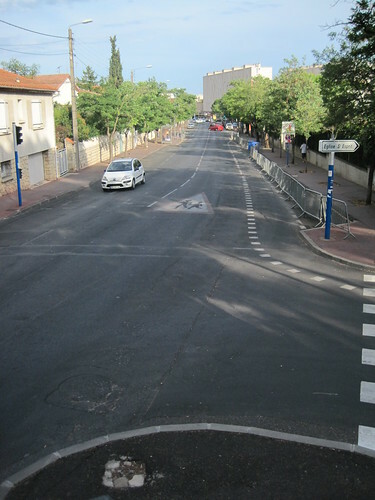 Last photo is looking down the course (and uphill) toward the Alco roundabout and Grabels. We'll try to reproduce these shots during the race tomorrow afternoon.